Truth “Trumps” RINOs & Crooks! In Poker, a Royal Flush trumps a Full House. In the 2016 Presidential Race, it appears that a Trump trumps both the Royal (Bush/Clinton) Flush, and the Full House of Establishment Cards that has turned America into the borderless mass of schizophrenic identity disorder we are today. Dysfunctional would be a rather more polite description of what we have become. We are a mess! Within hours of the Trump immigration shot heard ‘round the world, another shot rang out on a pier in San Francisco, and 32-year-old Kathryn Steinle died in her father’s arms moments later…the random victim of the very element of illegal immigration that Trump had called attention to only hours earlier. The attacks on Trump also reminded me of the attacks I suffered (on a slightly smaller scale from the same exact people) after voicing my objections to the Mosque at Ground Zero. I was instantly labeled a hateful bigot, racist and worse for siding with the families of the victims and first-responders in questioning the appropriateness and the timing of placing a Muslim Mosque where Muslim Terrorists forced 32 –year-old single moms to leap 100 floors to their deaths along with 3,000 other Americans. At first I loved the idea of a fearless Trump on the campaign trail as someone who could neutralize the PC Police once and for all. I never took him seriously beyond that. But watching him fight for America and seeing the fear and panic on the Left, and in the ranks of establishment politicians, and watching the media realize their bullets don’t faze him, I think he is exactly what America needs in the White House. He’s courageous! He’s a leader! He cannot be bought! And he LOVES America!! The more I think about it, the more hopeful I become. A Bush-Clinton fight is America slapping herself in the face. The ultimate kabuki fight in the ultimate kabuki theater. A Trump-Clinton fight on the other hand, would be very interesting. One of the most successful and well-respected businessmen of all time against one of the sleaziest and most corrupt political crooks of all time! 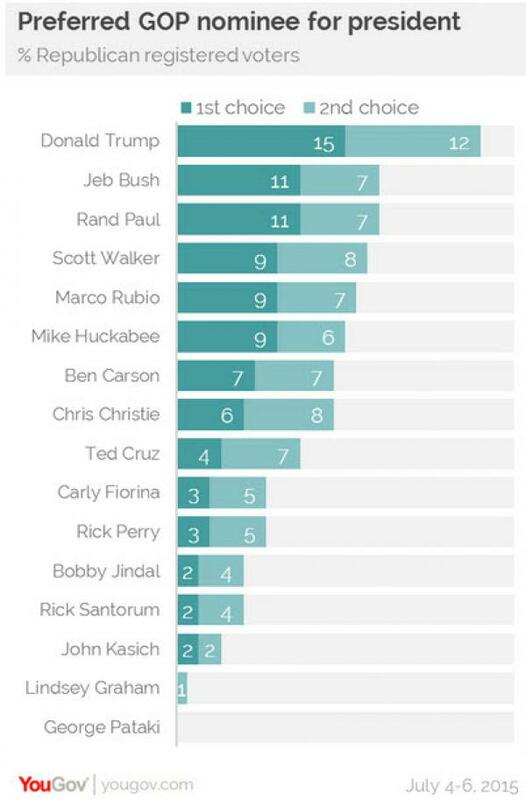 I honestly do not believe that any of the other Republican candidates are capable of what Donald Trump is capable of. In fact, it would almost be the ultimate poetic justice to knock out the Republicans and the Democrats in the ring at the same time as a Third Party contender! Move over Ali-Frazier, there’s a new fight of the century a brewin’! Please share your thoughts here. Pick your ticket. Personally, I like Trump/Carson and Trump/Fiorina! Truth would love them too I bet! What say you? This entry was posted in Economy, Entertainment, Politics, Religion, Society, Uncategorized and tagged 2016, Arizona, arpaio, clinton, fiorina, illegals, immigration, phoenix, presidential, steinle, trump. Bookmark the permalink. 2 Responses to Truth “Trumps” RINOs & Crooks! Donald is my hero. He is standing up to the insanity like no one else in the presidential political arena right now. It is like a breath of fresh air! It is like the kid in the story of the “Emperor’s New Clothes” don’t you think? I remember as a child reading this story and asking my mother how could everyone be pretending and acting like everything is okay. Little did I know that that is what my USA would be doing in 2015! Kudos Donald. I love Ben Carson as your running mate. He is another man who dared to stand up in front of the Emperor and say ….well you know. Trump/Carson. Yes D, I like your “Emperor’s New Clothes” analogy. The Establishment Politicians are the Emperor…and The Donald is taking it to ’em!! I LOVE how they tried to “tone him down” and he “ramped it up”! They have NO CLOTHES!!!! !